The Ys series is one of the most popular games series of the Japanese game developer Falcom which is also known for the Legend of Heroes series as well as for Tokyo Xanadu. The PS Vita already received two Ys games in the past: Ys: Memories of Celceta which came out in 2012 and Ys Origin which was released this May. 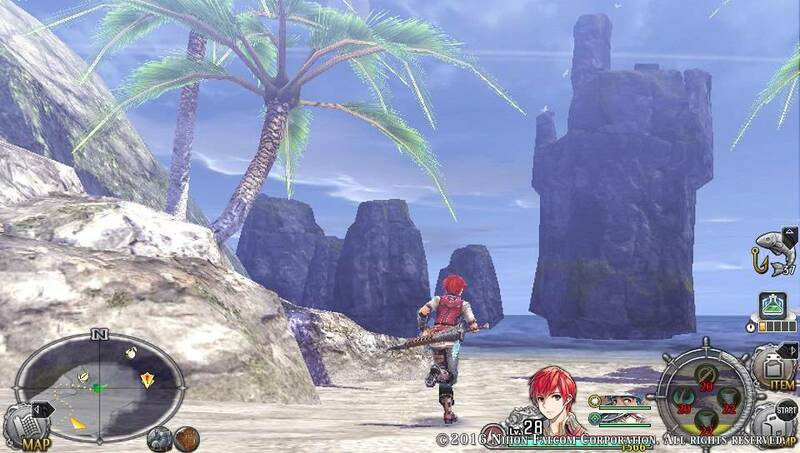 Ys VIII: Lacrimosa of Dana was released for the PS Vita in Japan in July 2016, followed by a PS4 version in May 2017. Previous Ys games were normally localized by XSEED Games so everyone was expecting an announcement from this company. 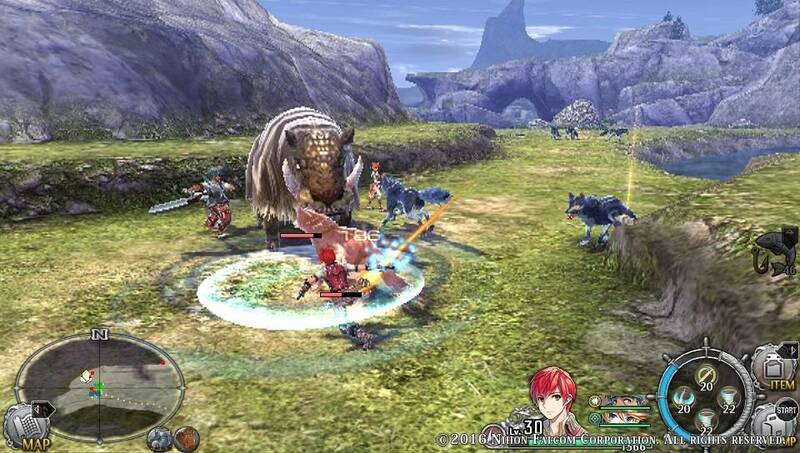 It was quite a surprise when NIS America announced in February 2017 that it will localize Ys VIII: Lacrimosa of Dana for the west. Besides Ys Origin, I never played any of the other Ys games before so I won’t be able to compare this title to the previous games of the series. But I did play the Japanese demo of Ys VIII several times that made it as one of my most anticipated games of 2017. 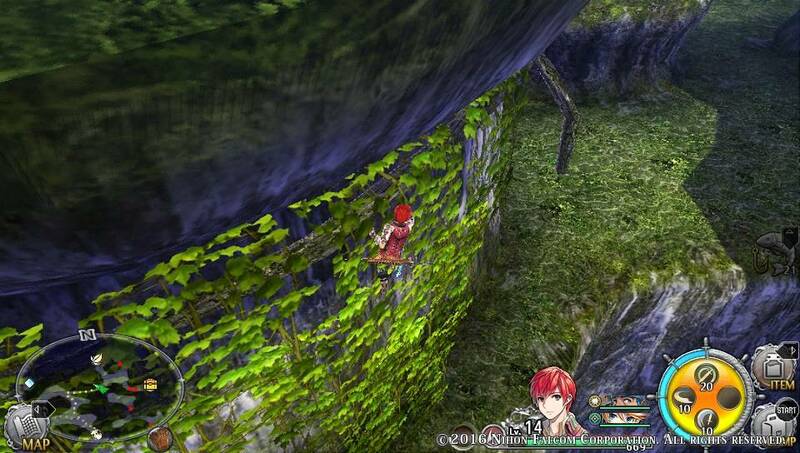 The Ys series focuses on the adventurer Adol Christin and his comrade Dogi who always follows Adol on his journeys. 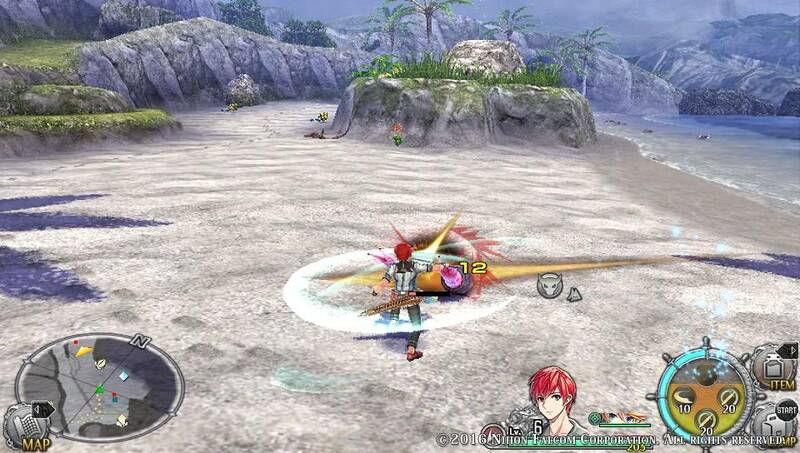 In Ys VIII, Adol and Dogi are on their way headed to the continent of Eresia on the passenger ship Lombardia. 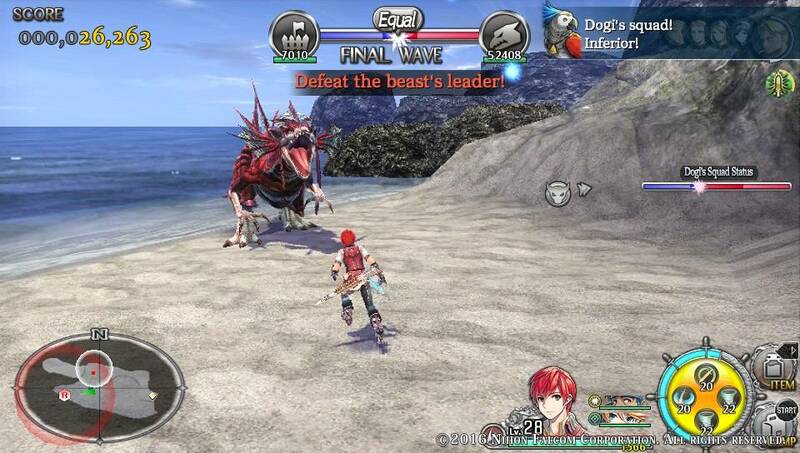 When a giant creature attacks the ship, it sinks in the ocean and Adol awakes shipwrecked and stranded on the mysterious island Seiren. The story evolves around the exploration of the island and finding the other passengers from the sunken ship Lombardia. 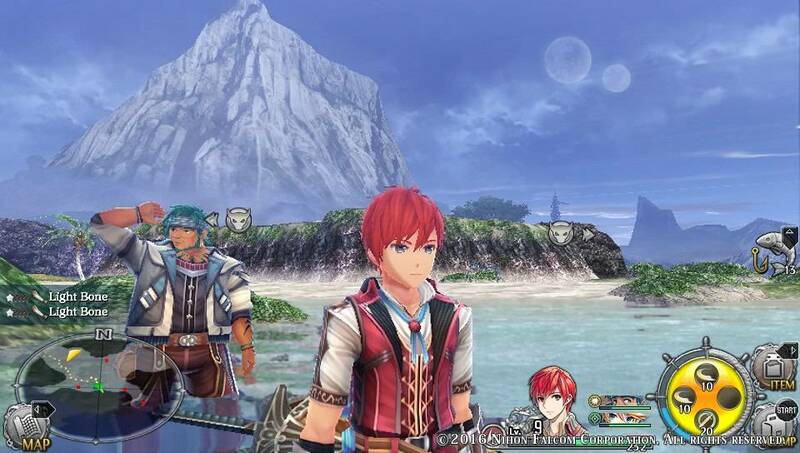 Some of the met characters will join Adol on his adventure while others stay at Castaway Village which acts as the main hub of the game. When Adol begins to dream of the blue-haired maiden Dana, the story develops and reveals more about the cursed island and its mysterious monsters. Especially with the introduction of Dana, the narrative became quite emotional and made it worthwhile to play the game until the end. Characters are likeable and there are also a few jokes that made me laugh. The game is divided into 6 chapters and begins with a prologue and ends with an epilogue. While chapters 1 to 5 are all consistent in their story telling, I found the sixth chapter to be the weakest as it felt too repetitive. 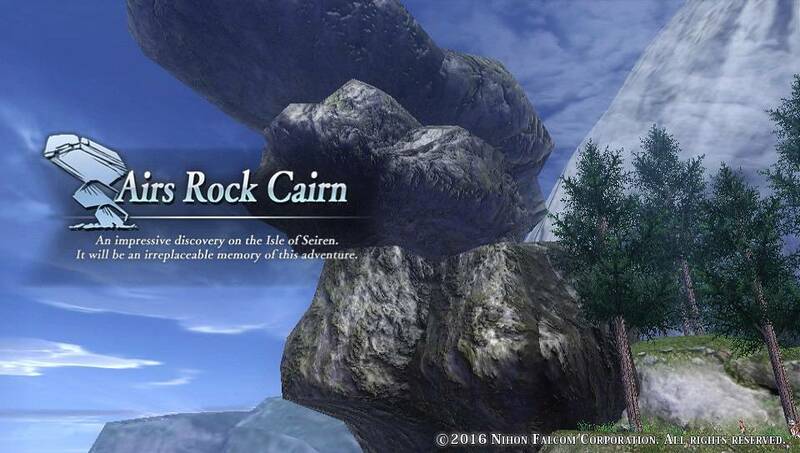 Ys VIII: Lacrimosa of Dana is an action RPG with the main object to explore Seiren Island and to fight its monsters. All exploration begins from Castaway Village, a self-constructed village by the castaways which acts as their hideaway. By finding more survivors, new story paths become available as formerly unreachable paths can be unblocked. The game’s attack system is straightforward and easy to understand. With the attack button, you attack monsters and by consecutively pressing this button, you can unleash a standard combo. There’s also a charge attack which automatically becomes available after some standard attacks and will be unleashed when the character flashes. You can also do a jump attack as well as a downward thrust. By attacking enemies, your Skill Level increases (SP) that lets you unleash Skill Attacks. These are special attacks that deal more damage to the monsters, with more skills to be learned during battle. For each character, skills can be set individually. With the automatically charging Extra Gauge, you can unleash an even more powerful attack. By pressing the L button, you can perform a Flash Move to dodge an enemy attack at the correct timing. A Flash Guard can be activated with the R button to guard an attack. Successful Flash Guards also increase the Skill Level. Party members can be switched on the go that you always can choose the character which suits best. The original button setting of the game is not very intuitive and I recommend to change the buttons for attack to Square, Jump to Cross, Switch Character to Triangle, and Lock-on to Circle for the best gameplay experience. Monsters never get boring as each area introduces new species and it’s a joy to see how much effort Falcom has put into the monster design. The various boss fights are one of the highlights of the game and although you never know when one appears, most of them are quite good to master. Only with one of the last bosses I had some difficulties and I had to change the difficulty for this fight to easy. Ys VIII: Lacrimosa of Dana has also some neat metroidvania aspects. During the adventure, you will find or get new gear and enhancements such as an Archaeopteryx Wing that lets you double jump or Grip Gloves to climb ivy to reach formerly unaccessable parts of the island. As the main focus of the game lies in exploration, you will find lots of materials and objects which you can be used in Castaway Village to enhance or forge your weapons and armor. You can also craft healing items or cook meals that are useful when your party is low on health. It’s also advisable to enhance the defense of Castaway Village as it will be attacked several times by monsters in so called interceptions. Storywise, the interceptions make sense that monsters attack the hideaway, but the execution of them doesn’t fit to the game. The interceptions feel like an arcade mode where you fight in 3 waves to protect Castaway Village from the intruders. Although the locations vary, the interceptions become boring after a few times as they always work the same way and only differ in monsters. At least most of the interceptions are optional but annoyingly, some of them can’t be skipped. One good feature of the game is that you can jump to previously visited places on the World Map which saves lots of time. But unfortunately, the World Map system has also its issue as it makes it difficult sometimes to find the correct way to the next story location as it’s too imprecise. As the smaller area map doesn’t show the neighboring regions, you have to use the more detailed mini map and zoom in and out to search for the story icon. Due to that, I got stuck a few times searching for the right way which became a bit annoying. Sadly, the camera system is also its flaws. While standing, the camera does what you expect from it. But when you are moving with your character, it always centers vertically that you have to manually adjust the camera when you are going upwards. I don’t understand why Falcom implemented this annoying auto-centering as I don’t see any technical reason for it. 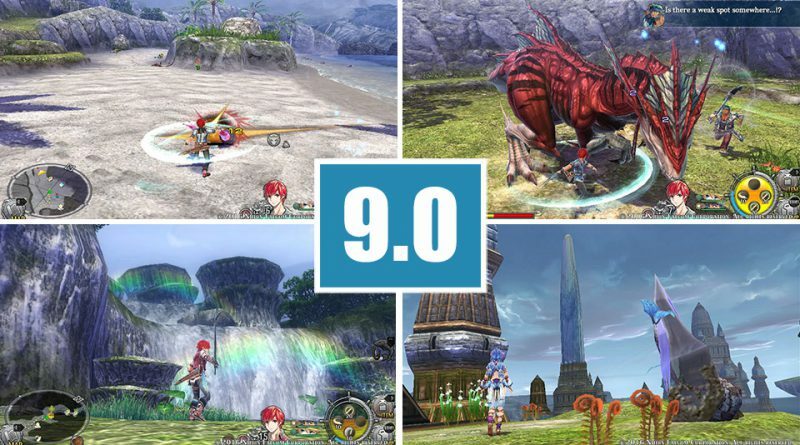 But besides these few issues, Ys VIII is a joy to play, either in short or longer gameplay sessions. I never had any problems with the localization by NIS America and I find the recent critics a bit exaggerated. But all who are more sensible than me should wait until November when a free patch will become available to improve the localization. To complete the story, it took me exactly 40 hours with a total exploration rate of 90%. I didn’t do all optional side quests which explains the missing 10% exploration rate. The rest of the side quests should add 4 – 5 hours to the overall gameplay time. Ys VIII: Lacrimosa of Dana is definitely one of the best looking PS Vita games with its various beautiful locations. It’s always a special moment when you uncover a new spot introduced with the words “an irreplaceable memory of this adventure.” Due to the setting on an island, playing the game feels like being on a vacation on a tropical island. Due to the impressive graphics, the framerate has to lack a bit behind which doesn’t surprise but it is constant enough that the game is always perfectly playable. Especially in cutscenes, you can see some stuttering when the area moves but due to the game’s beauty, it’s excusable. The soundtrack of the game is awesome as well as each area comes with a different setting. The music adds much depths to the game and always fits to the moment and the location. The English voices are fine, too and much better than previous localizations by NIS America (God Wars: Future Past for example). Ys VIII: Lacrimosa of Dana is graphically one of the most impressive games on the PS Vita. Together with the awesome soundtrack and the great playability, Ys VIII is probably one of the last great PS Vita games that every Vita owner should have. Despite its fews flaws, the game is a joy to play and absolutely worth its money. The review was written and provided by Michael. All screenshots are from the PS Vita version. The review is based on a review copy which was provided by the publisher.